When was the last time you had a smear test? Do you know when your next one is due? As a young woman it can be so easy to over look those reminder letters and think that it doesn't apply to you. However, cervical cancer is the most common cancer in women under the age of 35 and approximately 3,100 women are diagnosed in the UK each year. If you've missed a smear test you wouldn't be alone. Incredibly, research released today reveals that over 5 million women admit they're not up-to-date with their cervical screening appointments. In fact 1.1 million women admit they have never had a smear test. Women questioned in the research quoted pain, embarrassment and struggling to get to an appointment as the main reasons. This I can relate to, it's hard enough to get a medical appointment these days but the idea of telling my (male ) boss that I needed time out of the office to attend a smear test makes me blush just thinking about it. Research commissioned by GynaeHealth UK to launch their Target100,000 campaign reveals the average UK woman is 672 days late for her smear test appointment. For many of these women, the anxiety around smear tests could be alleviated if they were able to comfortably collect their own sample in their home environment. Target 100,000 is a campaign which aims to get more women involved in cervical screening. The initiative, launched by GynaeHealth UK, offers an alternative to a smear test. 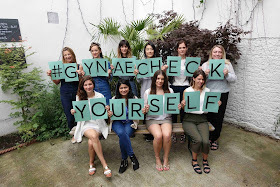 GynaeCheck is an at-home self-screener that can help identify women at a higher risk of developing cervical cancer. Earlier diagnosis of the disease can help reduce the number of women who die from cervical cancer every year in the UK. GynaeCheck is a self-sampling device available to women over 25, which detects the Human Papilloma Virus (HPV), the cause of 99.7% of cervical cancers. GynaeCheck has been expertly developed by gynaecologists, is highly accurate and has been used effectively by over 30,000 women across the globe. 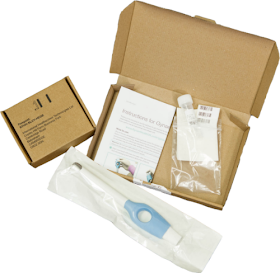 The GynaeCheck device is narrower than the speculum used by doctors and collects a fluid that has rinsed the cervix rather than a cervical brush sample, which makes it less painful than the traditional smear test. As well as taking away the pain aspect this test can be done in the comfort of your own home and then simply posted off so you don't need to take time out of your work day or family life to attend your doctor's surgery. Women who test positively for HPV are at a higher risk of developing cervical cancer and will be referred to their GP or gynaecologist for further cytology testing to check for abnormal (“pre-cancerous” or “cancerous”) cells. Women with a negative or clear result are advised to test again in two years’ time. To launch Target100,000 GynaeHealth UK are offering GynaeCheck at a reduced rate of £99 for the entire month of September as part of Gynaecologic Cancer Awareness Month. Visit www.Target100000.org.uk for more information on the campaign. I was asked to share this post as part of the #Target100000 campaign.I have been sent a GynaeCheck to review.